I always love it when a movie reaches you deep down to the core. Maybe it reminds you of your teen years or the central character is your teenage self projected on the big screen. Greg (Mann) is the “me” of the title and acts as the film’s narrator. He opens up by saying that his senior year was the worst year of his life. He spends most of his lunch hour hanging out with his best friend Earl (Cyler) in their history teacher’s (Bernthal) office watching movies rather than spending it in the cafeteria with the various cliques that represent the student body. The friendship between Greg and Earl is unique and goes back to their childhood. Greg typically refers to him as his “co-worker” instead of best friend. 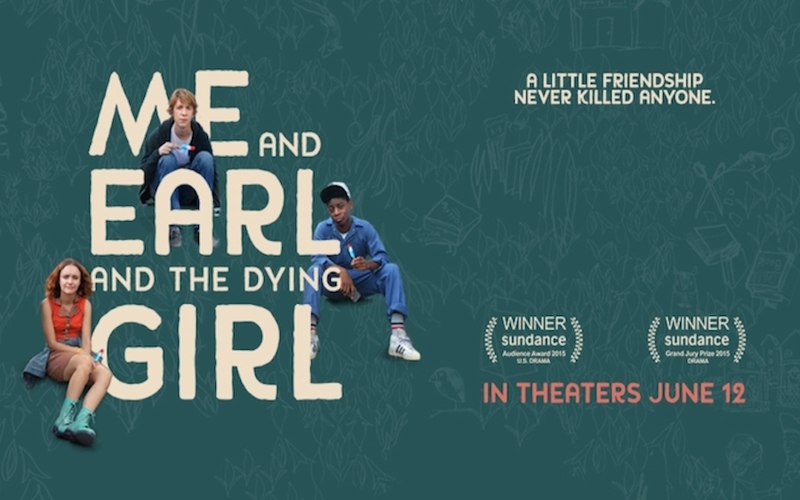 Don’t worry, that gets explained in the film when they meet the dying girl, Rachel (Cooke). Greg doesn’t seek out new friends, but is forced by his mother (Britton) to go and visit Rachel after she is diagnosed with leukemia. At first Rachel doesn’t want any of his sympathy, but a connection between the two of them is made that afternoon. It’s not a romance, but the beginning of a deep connection between two friends. Greg’s the kind of guy that will use humor at such a tragic time in order to lighten the mood. Others may find Greg awkward and strange but Rachel, and of course Earl, see right passed that. The newfound friendship between the three of them is just what he needs, but it’s only a matter of time as Rachel’s health continues to take its toll on the both of them. 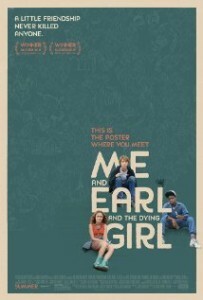 Me and Earl and the Dying Girl will quickly be compared to last summer’s weeper The Fault in Our Stars. Yes, people will probably cry during this film too. While there is that element of teenagers meeting due to cancer or leukemia, the comparisons between the two films end there, as there is no love story here. Greg reminds us continually that this is “not a romantic story”. This film doesn’t even attempt to go in that direction. It reminded me of other outcast teen movies that have come before like The Perks of Being a Wallflower mixed with a little Wes Anderson flare in its design and execution. Even though the film reminds me of those films in spirit, it really feels like a tribute to classic cinema typically associated with the Criterion Collection. As kids Earl and Greg would recreate classic movies with funny titles and low production values. Some of their films included: The 400 Bros., A Sockwork Orange, and Rosemary’s Baby Carrots. Make sure to stay through the credits, as there is a full list at the end. Some of the music from those movies ends up as the soundtrack for this movie along with music by Brian Eno. I applaud director Alfonso Gomez-Rejon and his design team for coming up with the ingenious titles and the designs behind each film. They invite Rachel into their geeky habit due to Earl’s big mouth, which then plays a significant part of the movie. A key factor in making these types of films standout comes with the writing of the teen characters and the actors that get to portray them. I guess you could say that about any movie, but a movie about teenagers can go south quickly if they aren’t relatable, feel like your standard high school stereotypes, or if you get inexperienced actors cast out of a mall casting call. We’ve seen plenty of those shows on the CW. Jesse Andrews, who also was the author of the book it’s based on, penned the screenplay. Each character has their own distinct voice and personality, even down to the parents who are flashy in their own right. Maybe this is supposed to represent the way Greg sees them. At that age we usually think of our parents as crazier than they really are due to our constant fear of being cool enough. Nick Offerman (“Parks and Recreation”) and Connie Britton (“Friday Night Lights”, “Nashville”) star as Greg’s earthy parents. I’ll watch Britton in anything, and Offerman is perfect as the hippy dippy dad you are embarrassed to be around. He doesn’t work and lounges around the house in his robe and eats bizarre food combinations. Molly Shannon is her typical funny Molly Shannon self as Rachel’s mom, always with a glass of white wine in her hand making inappropriate comments. The three leads of Thomas Mann (Project X), RJ Cyler, and Olivia Cooke (“Bates Motel”) all shine and prove they are young talent waiting to get noticed. Cyler is making his film debut as Earl and already feels like a nature. Hopefully after this film, they will join the ranks of Emma Watson, Dane DeHaan, or Daniel Radcliffe as top young wholesome talent. There is an effortlessness put forth by all three of them. They feel grounded with the material with authentic performances giving them an easy chemistry with each other. It’s no surprise that the film won the Audience Award AND the Grand Jury Prize this past February at the Sundance Film Festival. One of these years I’ll make it out there. You’ll laugh, cry, and feel all the feels as it completely touches your heart. I’m hoping it becomes that little sleeper hit that audiences flock to with strong word of mouth. Is It Worth Your Trip to the Movies? I’ve seen it twice now, and loved it both times. One of my favorite movies of the year.